These Weeknight Chicken Stacked Enchiladas are the perfect dinner for busy school nights! 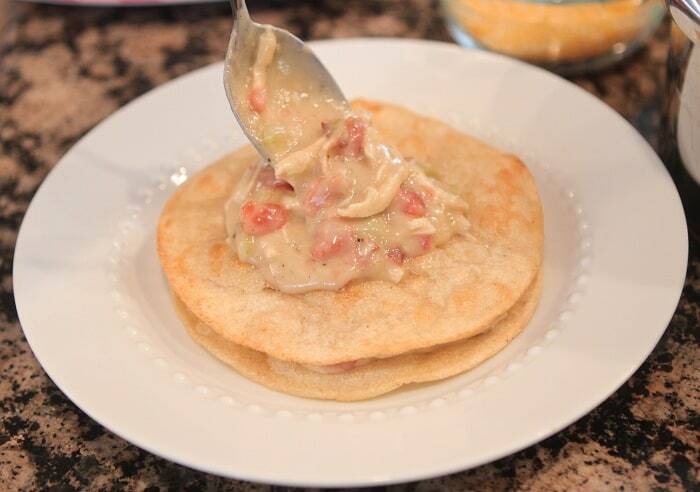 Thrilled to share this fun dinner recipe from 2013 with you! I love bringing back some of my favorites! 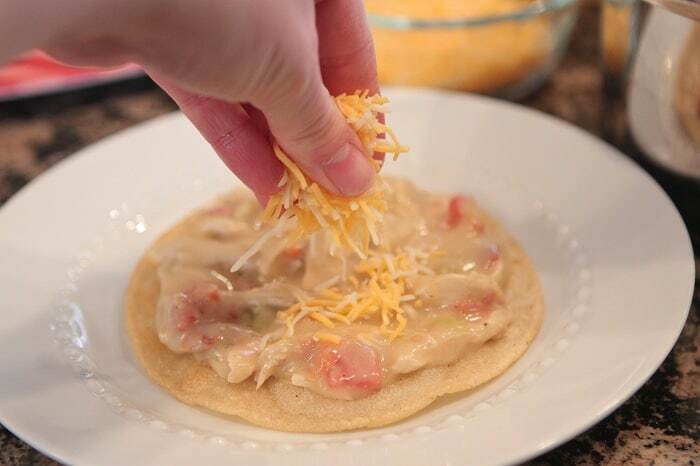 My Weeknight Chicken Stacked Enchiladas will have the whole family excited for dinner. Instead of rolling enchiladas into a baking dish, you stack them right on top of each other layered with my enchilada sauce, cheese and avocado. We start the recipe by making a simple roux. Melt a stick a’ buttah then whisk in your flour. Once smooth, whisk in your chicken broth until thick and bubbly. Time for the cheese! This cheese sauce is pretty ridiculous. Try dipping a tortilla chip and tell me what you think 🙂 Add your Ranch dressing seasoning and cumin next. 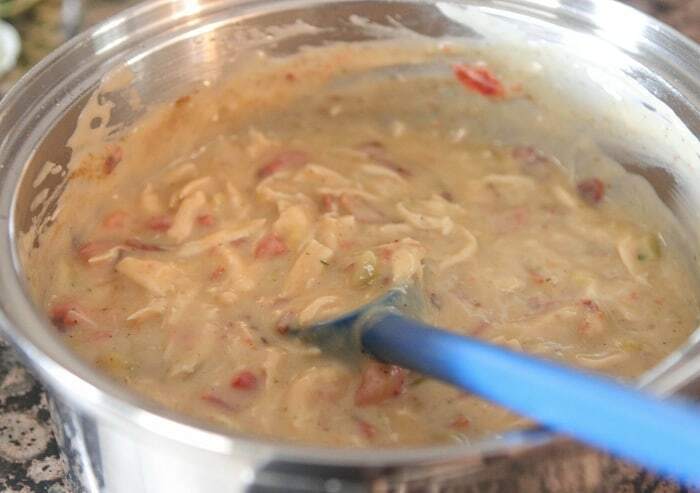 Add bacon, chicken, green chilies and tomatoes. Give a good mix and taste. Soooo good! You can use this sauce on a number of recipes. Try pouring it over pasta and nachos! Pan-fry the corn tortillas for about 30 seconds on each side. They’ll still be soft. Get a nice spoonful of your sauce ready. Spread a spoonful of enchilada sauce over a tortilla. Add a sprinkle of cheese please. Top with another tortilla and repeat with sauce, cheese, avocado slices and cilantro. Drooling over here. Yah, these are pretty incredible. Enjoy. Place butter into a medium saucepan over medium heat to melt. Once melted, whisk in flour until smooth. Slowly whisk in chicken broth. Heat and stir until thick and bubbly. 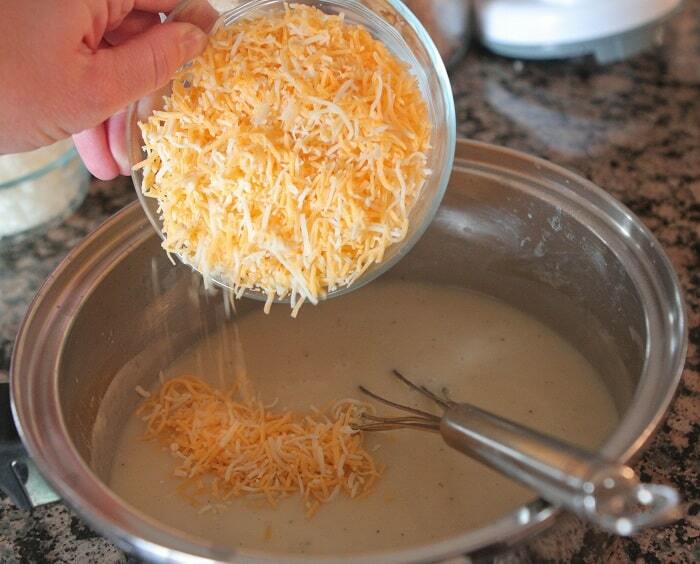 Once thick, stir in cheese and reduce heat to low. 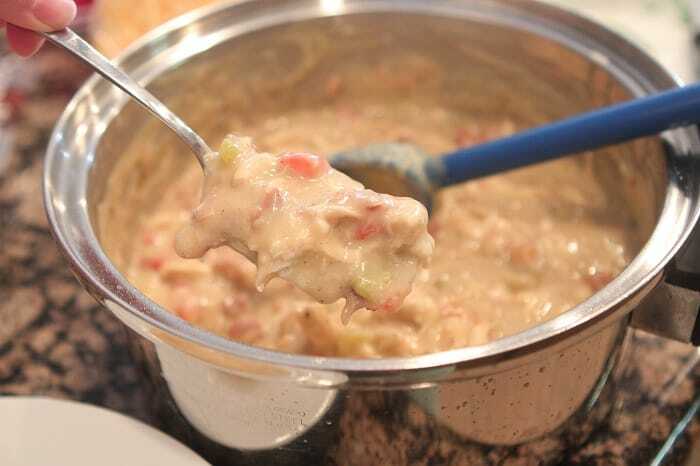 Add Ranch seasoning, cumin, bacon, chicken, green chilies and tomatoes, stirring to combine. Heat olive oil into a medium skillet over medium heat. Pan-fry tortillas for about 30 seconds each side and place on a paper towel lined plate to drain oil. Continue until all 12 tortillas are pan-fried. You may need to add more oil after a few batches. 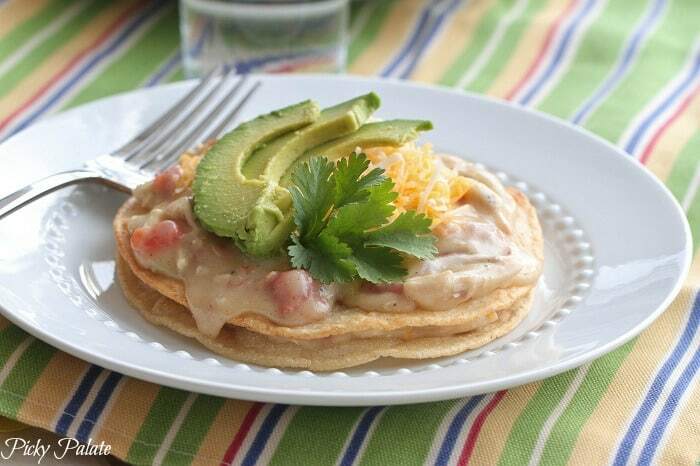 For each serving, place a tortilla onto a serving plate. Top with a spoonful of sauce and top with a pinch or two of cheese. Place another tortilla on top and repeat with sauce and cheese. Top with avocado slices and cilantro leaves if desired. Serve warm. There’s nothing better then enchiladas! And this stacked version, bring it on! Totally agree, stack it up baby! Enchiladas put me in a good mood when my wife has me on all these DIY projects before I head back to school. 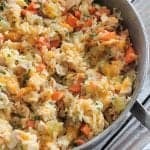 Looks like a fun and easy weeknight meal! 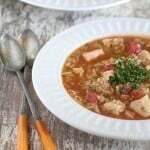 This recipe is great for busy weeknights! I could probably eat this sauce on everything!! YUM! What a tasty enchilada meal! I love the ranch dressing in this – great weeknight meal! We are on a Mexican food kick ever since our trip to Mexico!! Yes please! I made these for me & my husband last week he said it was as good as anything he has had at a Mexican Resturant! We loved them! 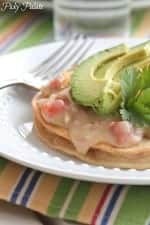 I added sour cream on top of the alvocado but other than that made it just like the recipe used lots of cheese!! used to be taking a look for. You have ended my 4 day long hunt!